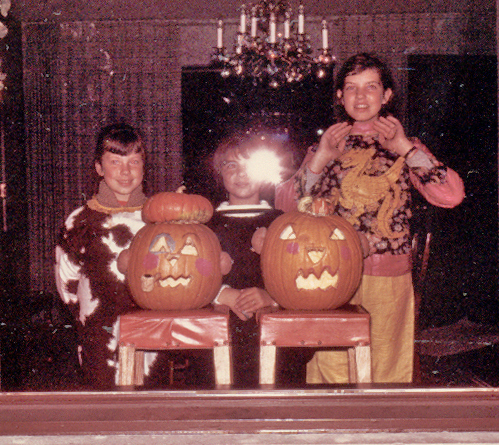 My sister and I did not go trick & treating very often. We lived in a fairly rural area with no close neighbors and my mother wasn’t very keen on us eating a bunch of candy, let alone from a stranger. There were just enough occurrences of poisoning and tampering every year to make her decide not to do Halloween. One year she relented and we went trick & treating with our cousin in her suburb. It was fun! Her Dad and mine were brothers. They enjoyed visiting with each other, walking with us, and the occasional jumping from behind a tree to scare us. My sister had a cow costume, mine was to be a Chinaman. My cousin was a witch. She was quite petite then and still is now. The hat made her quite a bit taller for a few hours. I’m not sure if she enjoyed having us with her or not, although her brothers were old enough to go by themselves and it’s doubtful they would have wanted her with them. After all, she was the little sister. This is the only picture I have from that evening. It wasn’t until I lightened it that I even realized my cousin was there between my sister and I. The flash reflection is from the front of her face – we were standing in front of a window and one of our Dad’s took the picture from outside the house. I keep it because it’s a memory of a fun evening. Word for tomorrow – RETRACT. If you prefer to work ahead, see the list for the week under “A Word A Day”. I can relate to your one treasured Halloween. I too did not do much trick or treating until one year when I was allow to go with a friend who lived in a village. Her parents let us run off on our own & I so enjoyed it. I have no idea where that friend has gone in her life but she certainly helped me have the best Halloween of my childhood. I loved trick or treating and that scary, tingly feeling of being out at night. It sure is different after dark on that evening! Aahhh yes! That’s where the love of Halloween began! Yes, it was a memorable one! One with my out-of-town cousins! I still love Halloween! Poor Mark didn’t have a choice…every year I made him a “special” costume. Even now John and I have had many parties. This year may be the biggest! With 6 other couples involved, we have rented an old gymnasium! I am so excited! Everyone that comes dressed in costumes is required to bring 4 food or hygiene products for the food pantry. Those not coming dressed…doubled! Should be fun! Thanks for sharing your blast from the past! It was a fond memory! Thanks for visiting and leaving a comment! It’s been really fun to see your Halloween pictures on Facebook – you guys sure do enjoy it. I can’t wait to see how this year’s party is.